We had just arrived the day before, having driven a few hours from our home, but it had already been a looong trip. The car ride was fine, but our attempt to see the sites of our nation’s capital had been a disaster so far. The plan was simple. Drive down, check in to the hotel, get out and hit the natural history museum. When all else fails, go for the dinosaurs. My children, five and seven at the time, were having very different reactions to this plan. Five year old Riley was thrilled. She was naturally inquisitive, asking lots of questions and wanting to see every exhibit, touch every button, see every short film. Seven year old Ryan was bored out of his mind. It was a boredom I recognize today as detachment, borne of an inability to visually connect with the world around him. Looking at exhibits in a museum just doesn’t do it for a kid like mine. He needs more sensory input to get engaged in an activity. He needs to touch, to feel, to climb in and be part of the activity in order to fully experience it. Otherwise, it just washes right over him like a wave. At least that’s how he was at seven. Things have improved somewhat since then, but we still haven’t been back to another museum as a family. And we probably won’t until we make the long promised pilgrimage to Toronto to visit the hockey hall of fame. Can you tell which smile is real, and which is forced? What’s unclear in my memory is how much we knew then. I think perhaps we were still somewhat in denial thinking that Ryan could act just like the other kids in the museum if only he wanted to. I’m sure we shushed him and corrected him and asked him to pay attention a zillion times during the visit too. The more I think back to it, the more I realize how naive we were. Regardless, the end result was disappointment. Not so much in Ryan, but in the situation. I remember looking around the museum and seeing lots of happy families with children younger than Ryan who were quite engaged in the exhibits and happy to be there. 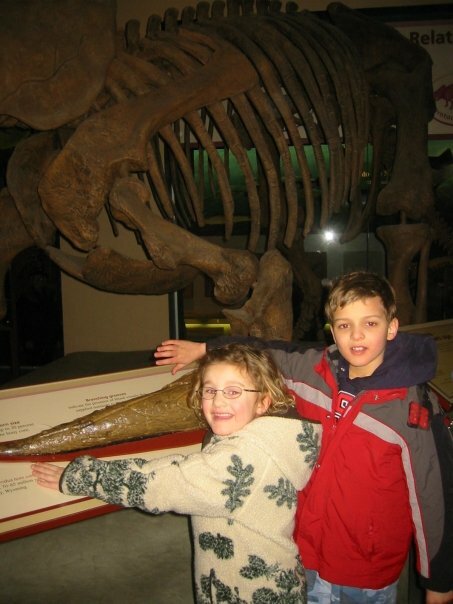 Having lived in Washington as a young child, I remember regular trips to the Smithsonian myself at that age and how much I always looked forward to them. I was sad for our family, for my wife Veronica, for Riley. My daughter wanted to take everything in but we were always running out of some place too soon for her liking because her brother just could not tolerate being there another second. Mostly I was sad for a reason that is a familiar refrain to parents of children on the autism spectrum, namely why did it all have to be so damn hard? Ryan was the reason for this trip. Well, at least the inspiration. 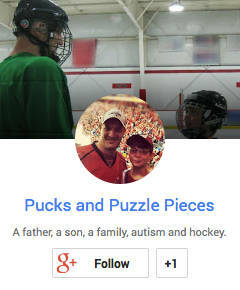 I had recently written an article about some hockey players who had formed a foundation to raise autism awareness after each had a child diagnosed. My conversations with the players quickly became quite personal and I realized that for the first time in the nearly five years since Ryan’s initial diagnosis of PDD-NOS I found myself speaking to someone who knew exactly what I was talking about. Rather than shying from the conversation about my son I found myself taking great comfort in it. For five years Veronica and I had only gingerly broached the subject of our son’s condition with others. As a result, we occasionally found ourselves in the difficult position of trying to convince some well meaning family member, that no, it was not “nothing to worry about” and there was no guarantee that “everything would be fine.” Talking instead to someone who truly Got It was like a light going off and I quickly forgot that the parents in question were professional athletes. It was at the suggestion of one of the players that we had made this trip to DC. The Washington Capitals were hosting an autism awareness day game to support his efforts at raising awareness. Ryan at this point hadn’t shown much interest in hockey. We had been to one or two games, but it was a struggle to get him to pay attention to the game. Not so with his sister. Riley loved it all — the action, the speed, the colors, the crowd noise, the fights, and most especially ice cream sundaes. About the only moment of enjoyment Ryan managed at his first game was when I tried to get him to cheer for my favorite team — those same Capitals. When I encouraged a “let’s go Capitals!” chant, he countered with “let’s go lower-case!” and was beaming when this drew laughter all around. I wasn’t holding out much hope for this game. Perhaps because we were naive, or maybe just gluttons for punishment, we tried the Air and Space Museum before the hockey game. More of the same. Riley was thrilled, Ryan was annoyed. At one point I turned my back for a second and when I turned back I found him trying to climb the ladder to the lunar lander. The proverbial rip cord was pulled shortly after. And so we made our way to the arena for the game with a mood that could best be described as depressed. One thing we have noticed about our son. At our lowest moments, he tends to do something to surprise us and pick us up. And so it would be this day. Something clicked. He showed interest from the moment we walked into the arena. He sat. He watched. He paid attention. He cheered (appropriately this time.) He gave Riley grief (she was for the Devils, he was for the Caps). He looked just like ay other kid. We looked just like any other family. Perhaps the best moment came before the game had even started. 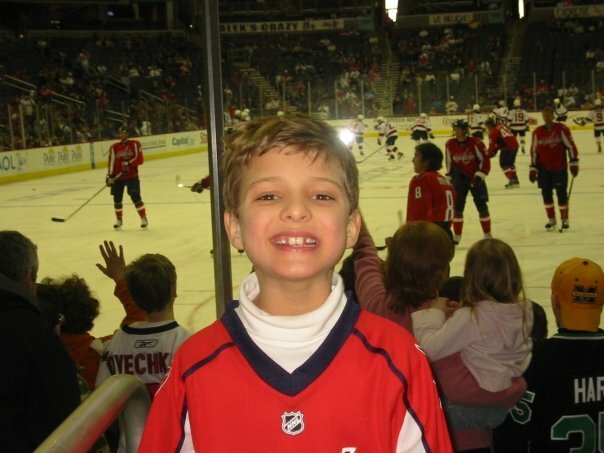 I had bought a Capitals jersey for Ryan with the name and number of their best player, Alex Ovechkin. During the pregame warmups, Ryan jumped out of his seat and demanded I take him to the other end of the arena, where the Capitals were going through their drills. “Because Alex has to see me in his jersey,” came the reply. They could have powered the arena lights with my smile. We ran to the other end of the rink. I’m not sure if Alex saw Ryan among the hundreds of other kids wearing the same jersey, but we did get a wave from Caps goalie Olaf Kolzig, who was the player I had interviewed who had suggested the trip. The best thing about the trip is that Ryan’s interest did not fade after we returned home. He and I would keep track of how many goals Alex scored the rest of the season. I taught him to follow the standings and we even watched a few games together on television — something previously unheard of for us. When the Capitals qualified for the playoffs on the last day of the season, we made plans to return to Washington for a postseason game, which would become the first overnight trip Ryan and I ever took together. Four years later and his interest in the sport is greater than ever. Sure, he focuses on statistical minutia. He is fascinated by standings. But he also loves attending games, watching them on TV, and playing the game himself. He is fully engaged, and has brought the rest of us along with him for the ride. Those words were yet another punch in the gut for a Dad that could not take any more shots that year. My husband defended his son and told the guard to back off. We were escorted out of the museum by security and have never returned. I have often thought of writing the artist to see if he would have minded a child hugging his bronze statue. Perhaps, I will. To all Dads out there, including you, thank you for keeping the passion for your child and for your family. I will follow your blog and wish your family happiness. I’d be willing to bet the artist wouldn’t mind. Not sure I could say the same thing about Neil Armstrong and Buzz Aldrin but who knows. Thanks for reading and taking the time to share a story. Keep trying! It’s what we do. It’s amazing how many times we’ve had an outing or trip that started as a disaster only to finish on a high note. Thanks for reading. Anyone that loves hockey is good people in my book.